A New Japan Aviation BN-2B-20 Islander aircraft was conducing a training circuit at the Kagoshima Airport in Japan. While on the downwind leg of runway 34, the aircraft was told to hold due to preceding traffic. This traffic consisted of a DHC-8 that was about to land and a Japan Airlines Boeing 767-346, flight JAL/JL651 from Tokyo/Haneda that was on final approach. The controller radioed "...following traffic Boeing 767, 13 nm on final". The Islander pilot replied: "Roger. Looking out." At 16:50 the controller reported: "Previous traffic 9 nm on final. Report traffic in sight." At 16:51:34, the pilot of the Islander sighted a DHC-8 flying on the final approach path about 1 nm from the threshold of runway 34 and assumed it to be the relevant preceding aircraft, and reported "Final traffic in sight." The controller then instruced the Islander to follow the traffic. 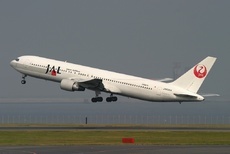 The Islander then turned on base leg, which was noted by the Boeing 767 on approach. The Tower then instructed the Islander to break to the west and to maintain the altitude. The crew of JL651 aborted the approach, carrying out a go around. The time of closest proximity between the two aircraft was around 16:54:12 when the horizontal distance was about 10 m and the altitude difference was about 250 ft (about 80 m). It is highly probable that this serious incident occurred because the PIC of Aircraft B misunderstood the DHC-8 that was flying in front of Aircraft A to be the relevant preceding aircraft, resulting in Aircraft B entering its final approach path after the DHC-8 and coming into proximity with the following Aircraft A. It is probable that the PIC of Aircraft B misunderstood the relevant preceding aircraft because the PIC did not correctly understand the traffic information on the type and location of the relevant preceding aircraft provided by the Tower. It is also somewhat likely that the fact that Controller A did not inform Aircraft B of the landing sequence when issuing the instruction to “FOLLOW” contributed to the occurrence of this serious incident.